I’m sooooo excited about today’s post because it’s all about my staircase gallery wall, which is full of vintage pieces I’ve collected over the past several years. Every single thing in this gallery has special meaning to me in some way–whether it be from a family member or a piece that reminds me of a sweet time in my life. I had so much fun putting this together because I intentionally chose items that I love and treasure. So come on in and take a look, I can’t wait to share the stories of each piece with you! 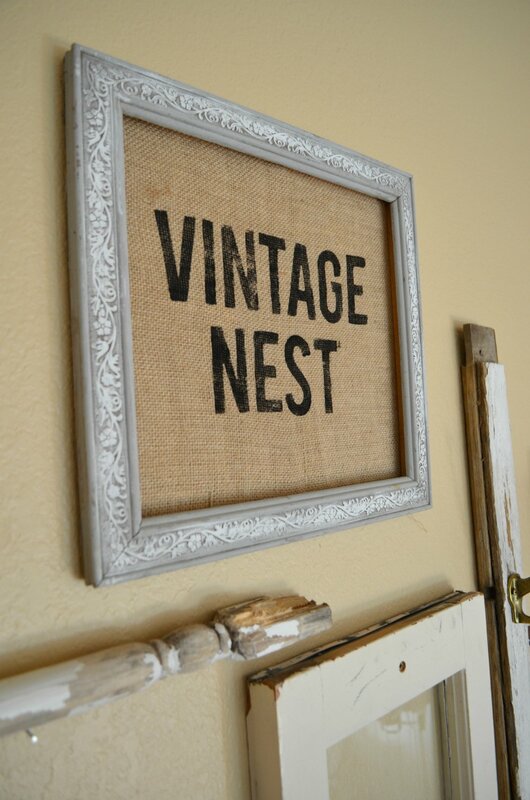 Starting at the top, this burlap Vintage Nest sign is something that I actually made. I’ll be sharing the easy tutorial for it soon, but I wanted to create something that was unique to our home. 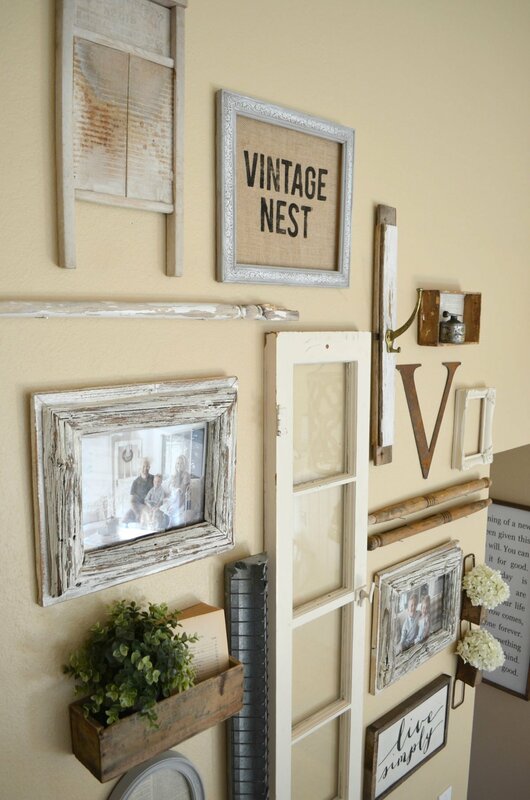 Vintage Nest seemed pretty fitting. Those spindles there are actually the legs of an old wooden chair that belonged to my great-grandfather. The chair was broken and in a few different pieces, but my dad gave it me anyway and I assured him I would find a place for them. I think this spot is perfect. That old cigar box belonged to my grandfather–we called him Gramps. I simply glued an old book page to the inside of it and nailed it up on the wall as a make-shift shadow box. And that little oil can sitting there inside also belonged to Gramps. We took it out of his barn after he passed away a few years ago. It’s one of my most treasured possessions. See that old brass hook? Well that was part of a hall tree my dad made for my mom when they were first married in 1978. We were cleaning out his barn recently when we stumbled on that old hall tree. It was in pretty rough shape and headed for the trash, so I snagged the brass hooks. I screwed this one onto a panel from an old window. I love it. Every time I look at it I think of them, newly married, in their first little home decades ago, with my dad’s DIY hall tree. Doesn’t get any better than that. Yep, that’s a chicken feeder my friends. And I hung it on the wall like the crazy lady that I am. This feeder is from my childhood home, where I grew up raising chickens and running wild and free in the country air. I have so many fond memories of that time in my life. I even had a pet chicken named Percy that would let me carry it all over the place and come running when she saw me. This reminds me of Percy, wide open spaces, and simple living. This little cheese box I found at an antique store last year makes the perfect cubby. 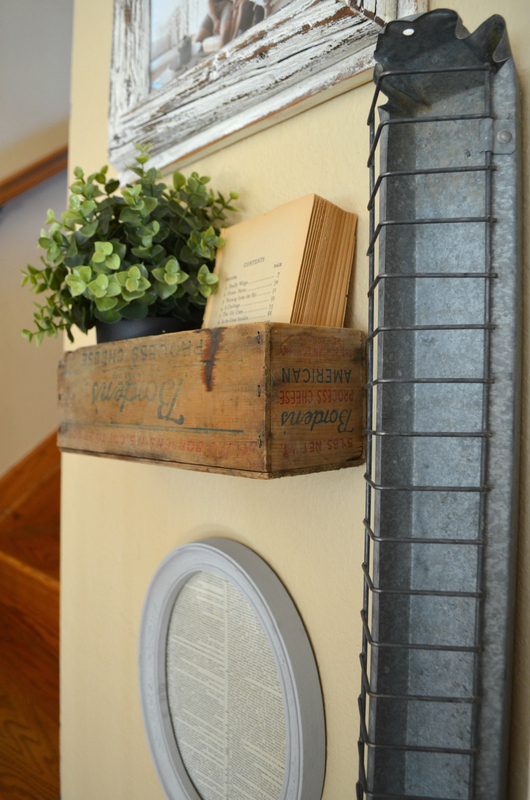 I just nailed it to the wall and put an old book and some greenery in it. Easy peasy. The vintage grain elevator cups on the wall there were actually a gift from my mom. She found it an an auction and I believe this dates back to the 1940s. Mom knew I would love it and she was right. I adore this rusty little thing and it makes the perfect spot for some purdy flowers. 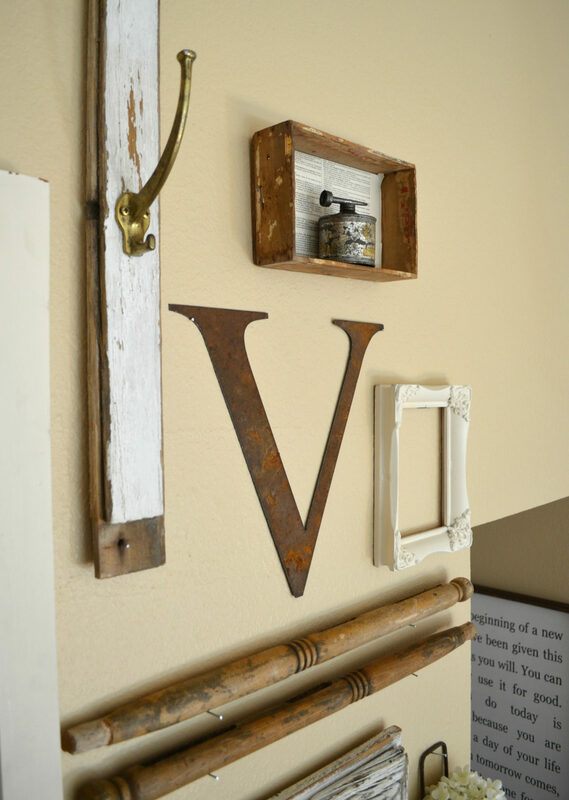 And last but not least is the Live Simply sign from one of my favorite Esty shops The Painted Nest. It’s such a great reminder to slow down, focus on what matters, and seek out a simple life. The thing I love the most about this wall is that it reminds me of so many special memories and people in my life. And the coolest part? I didn’t have to buy one thing to make this wall complete. 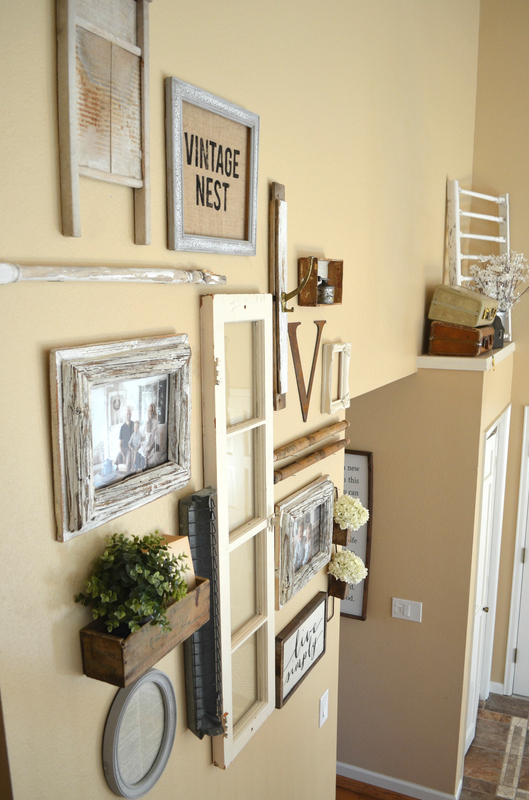 It’s all things I already had in our home and gathered together to make this gallery wall. And now this spot, that was empty just a few weeks ago, has become one of the most special areas in our entire home. 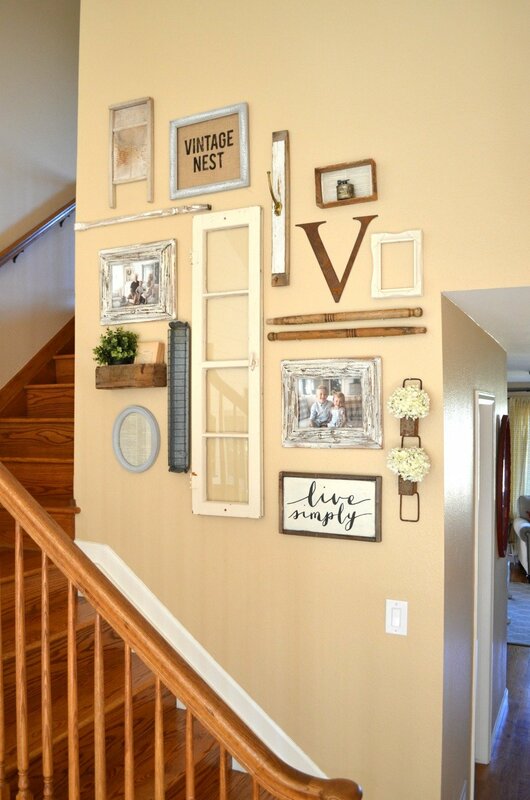 If you love vintage like I do and you love collecting things that have special meaning to you, I’d highly suggest gathering them all up and finding a space to make a gallery wall, big or small. I promise you will love it. Find me sharing all the things on Facebook, Instagram, Pinterest. Sweet and simple, love it! ???? Love it and so special the sentimental meaning behind the pieces. Wondering where you got the light? Have been looking for exactly that for what feels like forever. Oh my goodness I love all the treasures you have salvaged that have deep meaning and sweet sweet memories!!! ???? Thank you! You know I love my treasures! 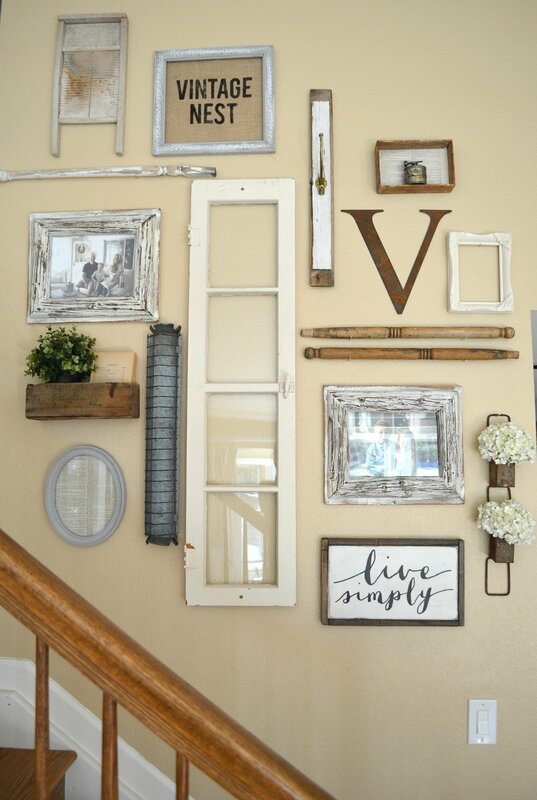 These treasures make your home unique to you! 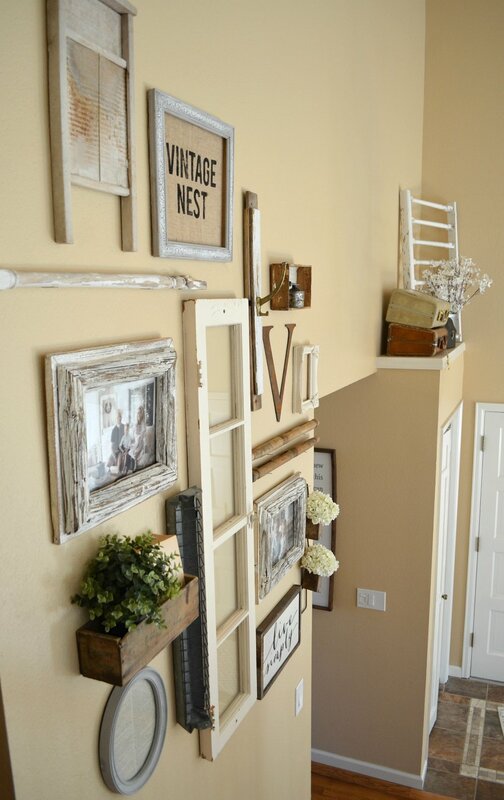 Way better than decorating with items that anyone can buy in a retail store!! 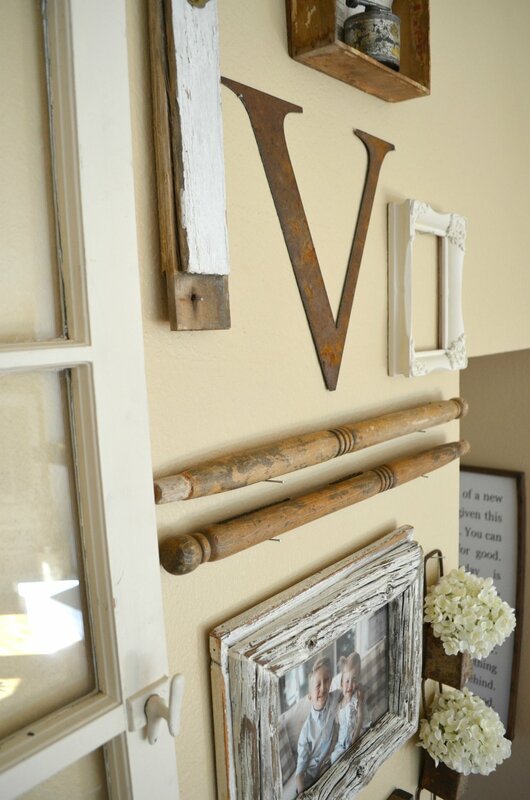 I completely agree Tina, decorating with pieces that have history is always way more fun. This is so cool!! Love all the items you put together to make it so special!! Some of the items (chicken feeder) I would have never thought to hang on the wall!! 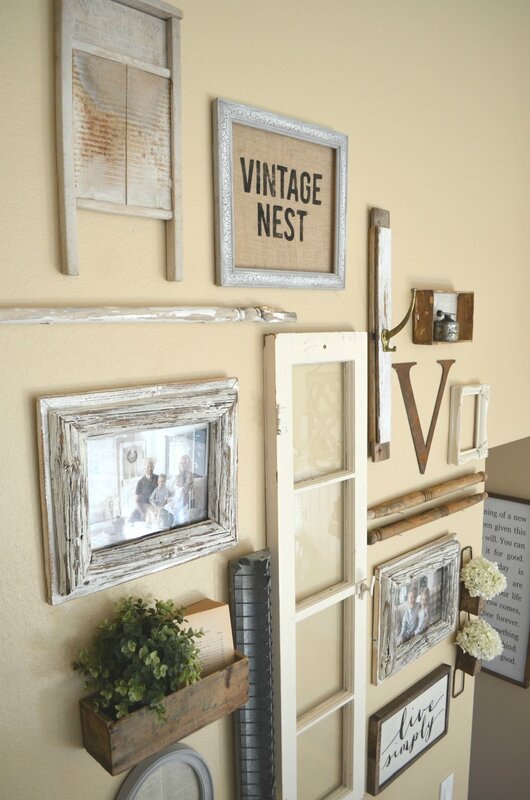 I’m just getting into this vintage thing and love all your creative ideas!! 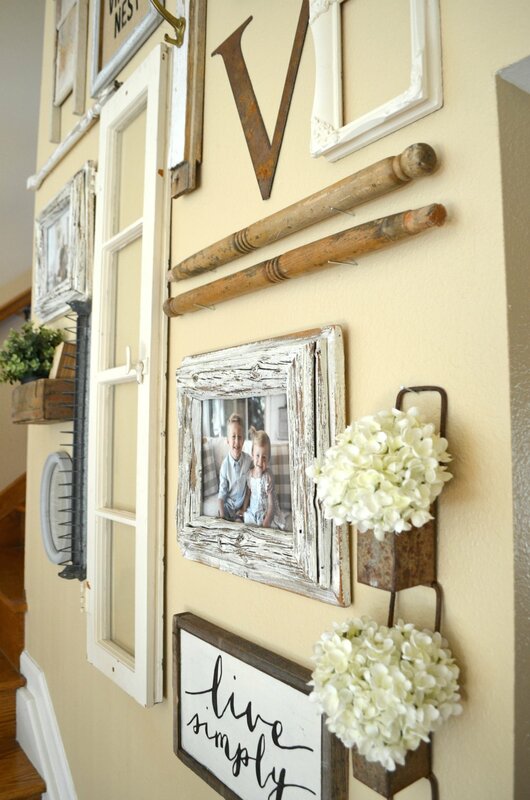 Your sweet wall is such a great reminder of special times and special people in your life. Love it!! Thank you Helen, I wish I had done this months ago! 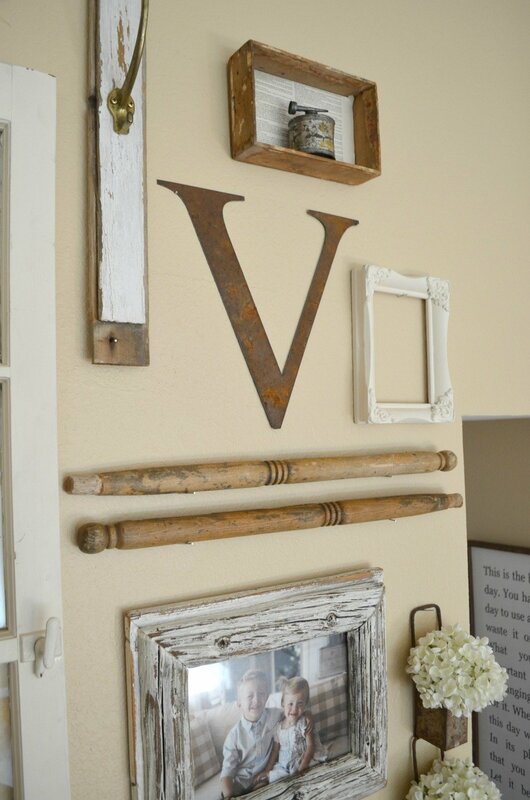 Love, Love, Love it…..beautiful. Have a great weekend!!!! Thank Doreen, I hope you have a great weekend! I just absolutely loveeee this! You’ve done it again! 🙂 Can we please take a moment and talk about that pendant light in a few of the shots too? Where did you get this?! Thank you so much! 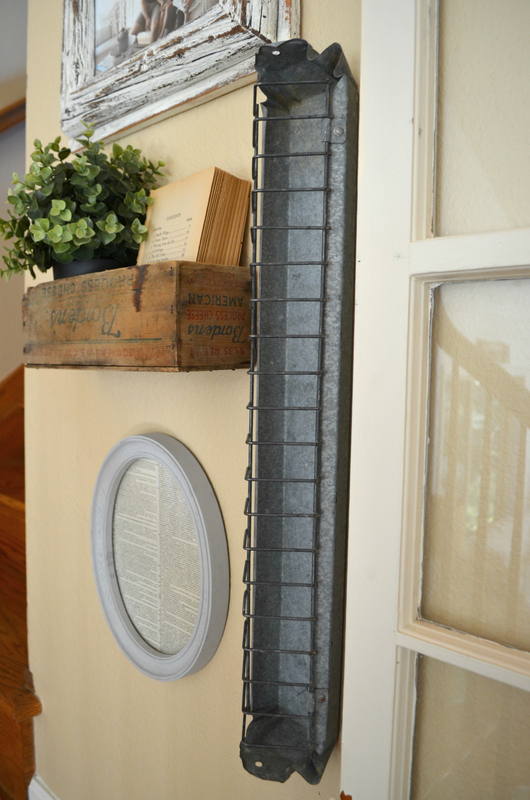 Glad you found the post for our new light! As I said in a previous post, will you come to my house and decorate? 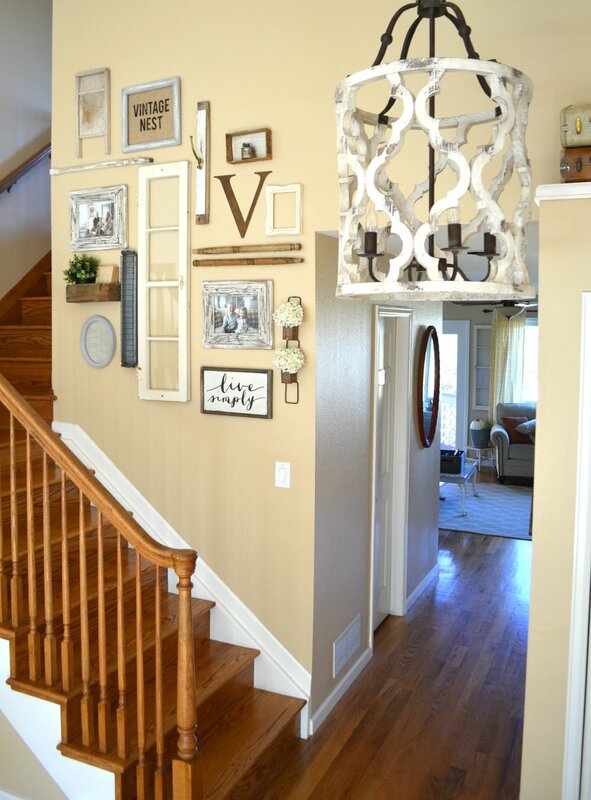 I love your wall and all that you have done to your house! I absolutely love it.!!! I love how all the pieces have meaning. Love this! 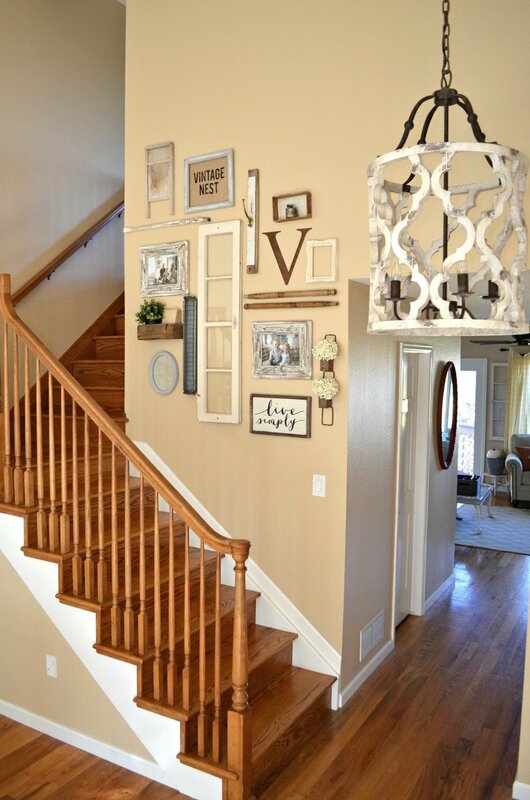 Can you share the brand and name of your wall color? Sure, it’s Autumn Blonde by Sherwin Williams. 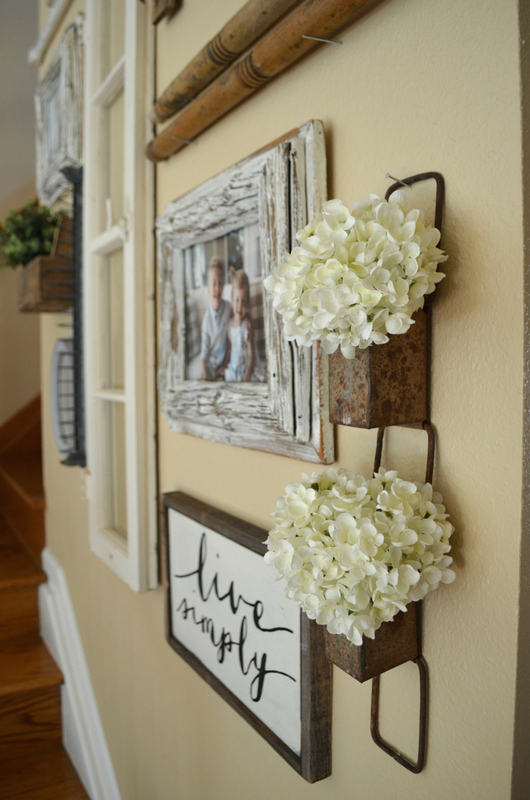 I love how you have used unexpected items to add huge interest and impact to the overall feel of your wall. Now im looking at my bits and bobs with a new eye. What paint color did you use? I love it! 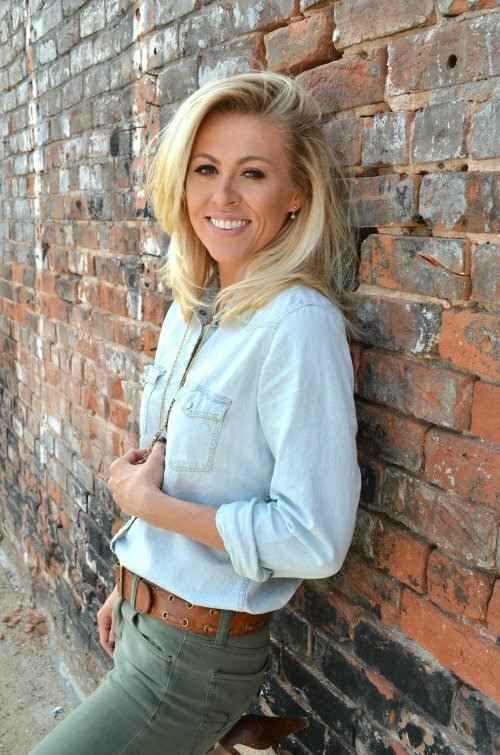 this paint color is Autumn Blonde by Sherwin Williams.